SATB choral arrangement is published by Walton Music. SSAA choral arrangement is unpublished but available by request. Original Text: Christina Rossetti (1830-1894), Goblin Market and other Poems (Cambridge: Macmillan, 1862). end R673 G63 1862 Fisher Rare Book Library (Toronto). 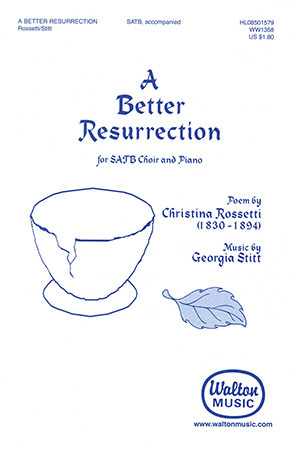 I have been a big fan of the poetry of Christina Rossetti since I discovered her in college. Her words, to me, have an innate music to them, and it has been a relatively easy task to uncover that music and set it down on paper. I have often said that some poems are so complete in their composition that the addition of music would get in the way of the work the poem does itself. By contrast, many of Rossetti’s poems are filled with emptiness and longing. They cry out for vocalization, for connection, and it is my hope that my music can fill those holes without compromising the poet’s original intentions. In “A Better Resurrection” I have taken what is basically an A-A-A structure and tried to vary the texture of each section so the sense of yearning grows throughout the piece, giving it a forward momentum. One key example of this thrust is the addition of the humming and “ah” sections. Note that the first thing we hear from the singers (m. 4) is a very closed sound, a “hmm” on a very tight interval, a major second. The next time we hear it (m. 40), as the singers have first asked for strength, the harmonies have begun to open up. As the music and text progress together, the harmonies get bigger and more open (m. 78), until finally at the end (m. 126), we have only the open fifth, the most vulnerable and open of harmonies, as the singers look heavenward for their own redemption. Originally conceived as a piece for SSAA ensemble, I am happy now to present the SATB version. I wish especially to acknowledge the Reverend Jay Wegman, formerly of The Cathedral of St. John The Divine, and to thank him for his support of this piece and of my work in general.